Discover the history of St Augustine whichever way you'd like! Get to know the history of St Augustine, the nation’s oldest European-settled city. Enjoy admission to three of its top attractions — the Old Jail, the St Augustine History Museum and the Oldest Store Museum Experience — plus an entertaining hop-on hop-off trolley tour of the city. At the Old Jail, get a compelling look at the cell blocks and gallows of this landmark site that held prisoners for over 60 years. Check out the maximum security area and the variety of weapons that were stored here. Actors in period outfits take you back to when this was a working prison. The St Augustine History Museum has over 400 years of history on display — toys and dolls from the early 19th and 20th centuries, a replica Spanish galleon and real gold, silver and jewelry that was found in lost treasures off the Florida coast. Then at the Oldest Store Museum Experience, watch the friendly clerks, butcher and snake oil salesman demonstrate the latest inventions for living at the turn of the 20th century, like a goat-powered washing machine and a gas-powered iron. Enjoy three consecutive days of riding the Old Town Trolley. 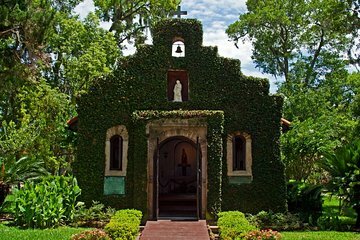 Learn about the 500 years of American history and happenings of St Augustine and enjoy the cobblestone streets, landmarks and pristine beaches as the trolley rolls along from one location to the next. Hop off at any of the attractions for a closer look, then hop back on when it’s convenient. It truly is a fun and fast way to get to know the city of St. Augustine and the many historic attractions it offers. It was a great way to see the city in a limited amount of time and for not a lot of money. We’d do it again. Great way to get around town! Worth the price! The mult-pass tickets were well woth their price and they saved us quite a bit. We took 2 of our grandchildren 9 and 5 and having the ability to go back to hotel for a swim in the heat of the day... and it WAS hot... kept everyone on an even keel and we enjoyed the trip much more. The guide was great, very informative. And boy, were we impressed with how he could handle the 'train' into those tiny lanes! Will certainly get the hop-on-hop-off passes should we go there again. Great way to easily see St. Augustine. Better than Red Train. After having this 3-day trolley pass, I realized that I would never go to St. Augustine again without it! It was invaluable, and very easy to access. I was able to park my vehicle at my hotel and didn't need it for the full three days! No parking problems! Our drivers were courteous and knowledgeable and entertaining! The tram ride is informative and great to get an overview of St. Augustine. Is is also nice that you can use it for several days allowing you to hop on and off to see different attractions. I included the Jail and Store tour in our package. The jail is a definite attraction to see, that was worth the price of the ticket for everything! The tour and the ability to hop-on hop-off was great. BUT the tram vehicle itself detracted greatly from the tour, if you are a senior with mobility issues. The seats were too hard and bouncy for folks with back problems. And the step up and down was too high for easy entry/ departure. At times I was too busy concentrating on these issues to really enjoy the tour. We used the trolley exclusively to travel around town. We had several different drivers but Lolo was by far the most informative and interesting. I learned so much about St. Augustine but need to go back to see everything we missed. Was very happy with tour. Thought was a little high for what u get though. Also very hard to tour some things with the large school groups in attendance.